One of the most satisfying legacies of CTG’s first 20 years is our network of government and industry partners, researchers, and graduate students; they are an integral part of CTG’s story. The numbers matter certainly, but at the root of this record is the extensive global network of colleagues who have partnered with us on our founding principle—that for government to effectively use technology to transform public service delivery and citizen interaction with government, we must focus on how technology, policy, and management interact. 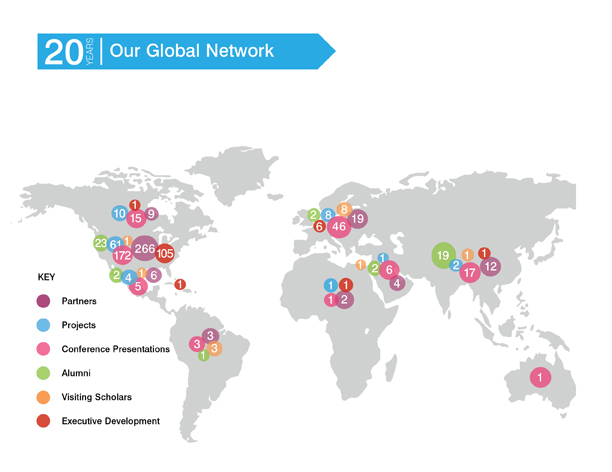 This map visualizes our global reach—where our partners, projects, alumni, visiting scholars are located, and all the places we have both shared our knowledge through presentations and executive development programs and in return learned valuable lessons and insights from our partners to add to our knowledge. Learn more about the graduate students who have worked at CTG over the past 20 years.